It is understandable that, by this point, many of the best names for online casino sites have been taken, and operators choose to deal with that in different ways. While some operators will go leftfield, find an unlikely name and concept and run with it, Genesis Global Limited has chosen to go a different way, naming one of their newest sites Casino Joy. That would be fine, it’s a nice enough name, but the fact that a site called Joy Casino already exists (not to mention numerous other sites with the word Joy incorporated into their name in some way) makes it a little less logical as a choice. Genesis Global are not the highest profile operator at this point, although the small number of sites they offer have proven popular with players, so having a name that can so easy be confused with another does not help much. This leaves Casino Joy with work to do, is it up to the task? If you like subtle, subdued colour schemes, then Casino Joy is not for you, as the design here looks like the aftermath of an explosion in a candy floss factory. Soft blues and pinks appear throughout, with the logo being basic and unimpressive, and the banner not containing the level of quality imagery we’ve come to expect from Genesis Global sites. It’s okay, and it advertises a good number of promotions, but we’ve come to expect more by this point. Scroll past that banner and you’ll find yourself face to face with a few thumbnails, that are searchable by category, in front of a white background. While other online casinos on this network have used white background awfully, making sites feel unfinished, it works much better here, provided a simple backdrop to push the games out front and centre. 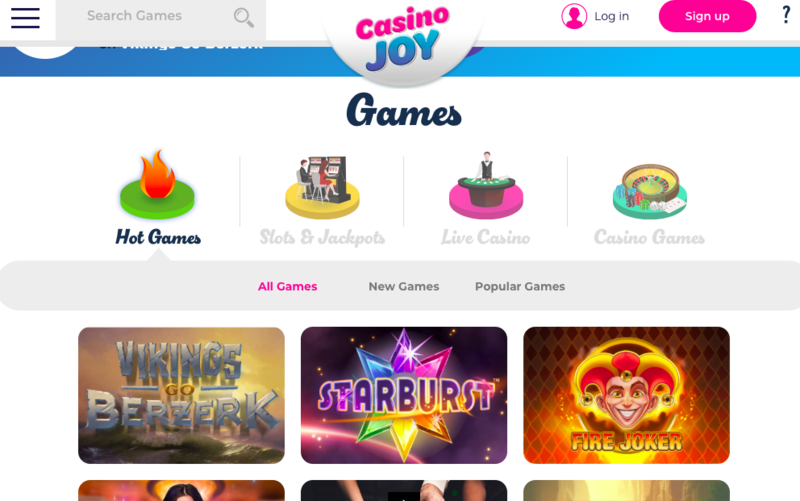 The design of Casino Joy is undoubtedly a question of taste, a colour scheme that would perhaps be more suited to a bingo site, and a lot of pastel colour, it’s not for everyone, but if it’s your thing, then you’re likely to enjoy it. Nothing is stranger when it comes to Genesis Global Limited casino sites than the collection of games that are on offer to players. With the same selection at Casino Joy as you’ll find at Casino Cruise, Vegas Hero, or any other site, the titles themselves number well over 1,000, which is immensely impressive. However, the large number of games is contradicted to some extent by the disappointingly small list of software developers that are providing them. While ELK Studios, Evolution, NetEnt, NextGen Gaming, Play'n GO, Microgaming, Quickspin, SG Digital, Thunderkick, and Yggdrasil are undoubtedly some of the very best developers in the entire of the iGaming industry, it takes variety as well as quality, and Casino Joy, like its network siblings, simply doesn’t offer enough of that. So while there are some of the best known and most loved titles around available here, if you’re looking for something different, maybe something new from a lesser known developer, you’re not going to find it here. 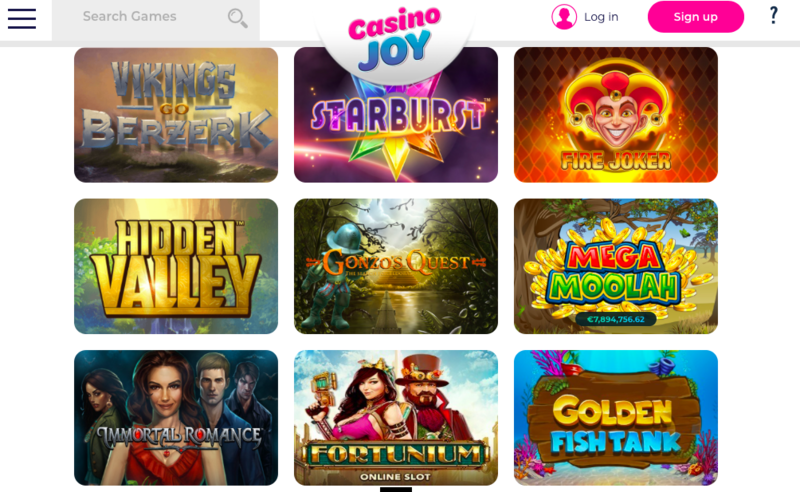 Casino Joy is, at its core, distinctly average, an uninteresting site that does little to stand out from its network brethren, let alone from the wider industry.